Photographing this Natural Wonder of the World certainly poses many challenges, and really requires a book to be written on it, however I have tried to detail below below some of the basics that might be useful if you are trying to get that great shot. 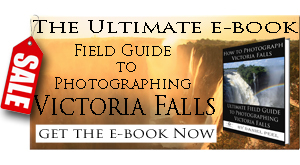 The information below primarily relates to photographing from the Zimbabwean side of the Falls. 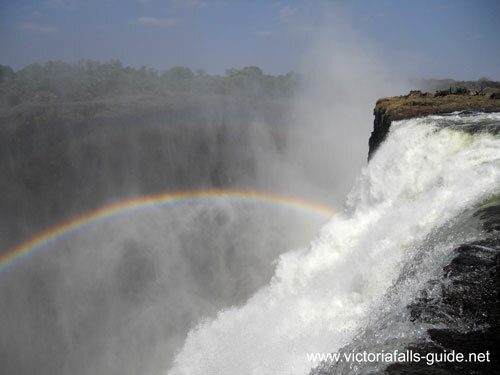 The chasm of the falls runs in an almost east west direction, with the Zambezi River flowing North to South. Therefore the sun crosses almost across the length of the falls, as it passes in its arc rainbows are produced. Rainbows are created by light refracted through the water particles in the mist from the spray, so as the sun moves so do the rainbows. You need the sun to be behind you to see a rainbow. I have found that the best time to get the rainbows in the right place for photographs is in the afternoon from 2pm onwards. 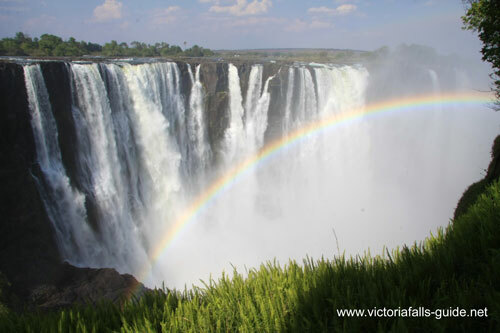 To see rainbows in the morning you will need to go as far east as you can or be in Zambia, look back west. Overcast days sadly produce no rainbows which can be very frustrating. The position and time of the sunrise and sunset varies considerably throughout the year, this seriously impacts those sunrise and sunset shots. A really good application that you can download for Free at The Photographers Ephemeris gives you accurate information on this. 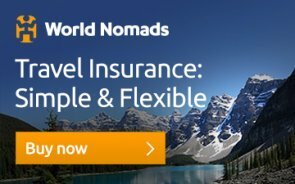 Using this application you should be able to plan according to the time of year you are going. As an example of this; in May, June, July, August and September the sunrises behind Main Falls allowing for great photos like this one below, but in November, December, January and February the sun rises much further to the right and you just wont get this photo then. Using this Photo which was taken in September as an example. In July the sun will rise in approximately the centre of the picture whereas in December the sun will rise out of frame to the right. 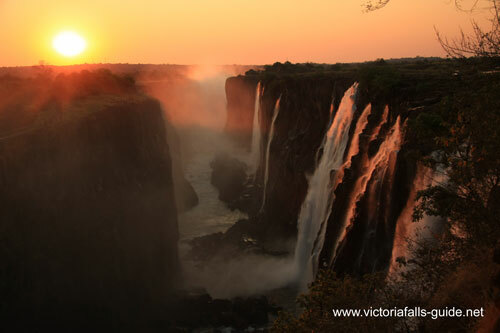 From about October through till February the sun rises before the gates to the Victoria Falls National park are open. So it's impossible to get into position before the sun rises. So careful planning is critical if you are after specific shots. 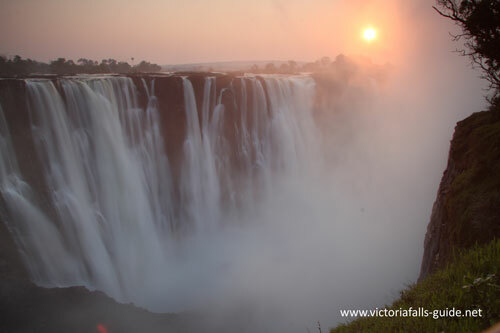 Sunset shots are best taken from Zambia seen in the photo below as you can look down the full length of the Falls with the sunset behind, plus the exit gate is close by enabling you to stay as late as possible and then packing up quickly and dashing out. Sunset shots in Zimbabwe have to be taken from Danger point which is the furthest point from the exit gate, at least a 20min fast walk/run. The time of the year also dramatically affects the volume of water cascading over the falls, please see our climate page for full details on this, but suffice to say here that from December through to April/ May the Falls are normally pumping. This is spectacular to see, hear and feel but makes photography all the more challenging. Not only is it difficult sometimes to see the falls themselves due to the huge volume of spray, but cameras obviously get soaked. It is one thing to let yourself get wet, in-fact I would thoroughly recommend this as it is part of the whole experience but it is not a good idea for expensive equipment. There are various ways to deal with this. I have found that a good sized umbrella works well (these can be hired just outside the entrance to the falls, if you have forgotten yours) for this operation you need an assistant, as you just weren’t born with enough hands. In very heavy spray even an umbrella won’t help though - as the spray is being blasted up as well a falling down. You will see lots of people trying to cover their camera with their hands to shelter it from the incessant rain with very little effect. Please don’t underestimate the amount of water at this time of year, if you want to take good photos and don’t go prepared you will walk away disappointed. Plastic bags work to keep your camera dry while you are walking along but are a hassle when you need to get your camera out to photograph. A possible tip here for SLR cameras is to get a big plastic bag and cut a hole in the side of it the same size as your lens circumference, then use an elastic band to seal the bag onto the lens. This will keep you camera nice and dry and you actually put your head inside the bag to take the photograph. If you have any friends or family with you, they will leave you at about this stage. The lens cap will keep the lens dry, removing it only for short periods to take the photos. Make sure that you take a dry lens cleaning cloth with you and keep it in a waterproof bag, as a your shirt will almost certainly get soaked and will be of little help to you when you get those few droplets of water on your lens. From May onwards the Zambezi waters start to recede as we go into the dry winter season, as the volume decreases the visibility increases as there is less spray, but less spray can also be less impressive. October / November is the height of the dry season and parts of the falls do completely stop flowing, this is particularly evident on the eastern cataract which forms the Zambian side of the Falls. If you are staying in Zambia at this time of year - I am sorry but you will be disappointed and you will need to make a border crossing to the Zimbabwe side to get a better view. 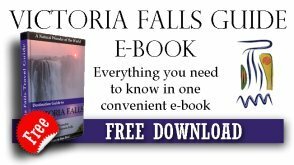 Having said that in Zambia you can take a trip onto Livingstone island, the view from there is spectacular as you are standing right on the edge of Main Falls as seen in the below photo. 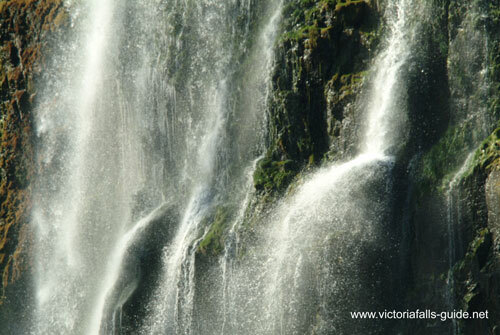 From Livingstone Island you are standing right on the lip of the Falls and some fantastic photographs are possible. This photo is looking west across Main Falls at about 10am and the rainbows are perfect. There is therefore no perfect time of year as each season has its merits and demerits. Each year is also different depending on the rainfall in the whole catchment basin which is huge. It’s a matter of making the best of whenever you are there. Polaroid filters if you have one are great to enhance the colour of the sky and clouds but unfortunately they will cut out your rainbows. A tripod if you are very keen on taking different shots is a good idea. Generally with the sunshine and the white water shutter speeds of your camera are very fast and no tripod is necessary. However if you want to get this silky effect of the water flowing, you with need to get your shutter speed down to a least 3oth/sec. Hand holding this is obviously impossible so a tripod in this instance is vital. Because of the amount of light you will need to use one or 2 neutral density filters to reduce the amount of light and slow you shutter speed down. Your polarising filter also works well here cutting out 1 to 2 f/stops. 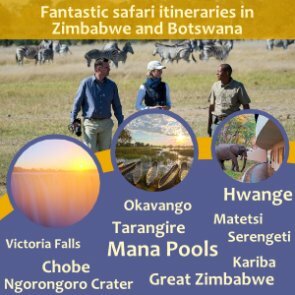 The Zimbabwe side has 16 magnificent view points along its length. These take you right to the lip of the falls. Wide angle lenses are generally the order of the day here, to take in as much of the panorama as possible. 28mm focal length is minimum but a 17mm is preferable. A telephoto lens is also useful at times to get tights shots of sections of the falls for dramatic effect, as seen in the photo below. *Can't find what you are looking for? Use Google Search to search this website for any term you are looking for.